Magnetron sputtering is widely used for deposition of various types of materials. Deposition of films of dielectric materials such as oxides and nitrides are conducted using r.f. sputtering. Epitaxial films can be grown on single crystal as well as biaxially-textured substrates by high temperature growth. Epitaxy development through materials of different crystal structures such as rock salts, perovskites, bixbyites, fluorites and others is achieved by optimized material selection and process parameters. Lattice, structural and chemical mismatch issues are addressed during epitaxial growth. With a capability for reel-to-reel processing, flexible substrates such as stainless steel, nickel alloys and polymers can be done especially in combination with the IBAD technique described earlier to grow near-single crystalline films on practically any substrate. The following figures show epitaxial growth of several films on IBAD MgO for superconductor (left) and photovoltaics (right) applications. 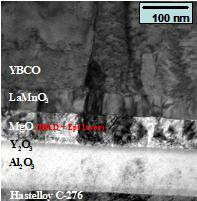 Homo and heteroepitaxy is achieved in these layers to a high degree that the biaxial texture in the IBAD template is sharpened in the YBCO layer from 5 to about 2 degrees and in the Ge layer to less than 1 degree. 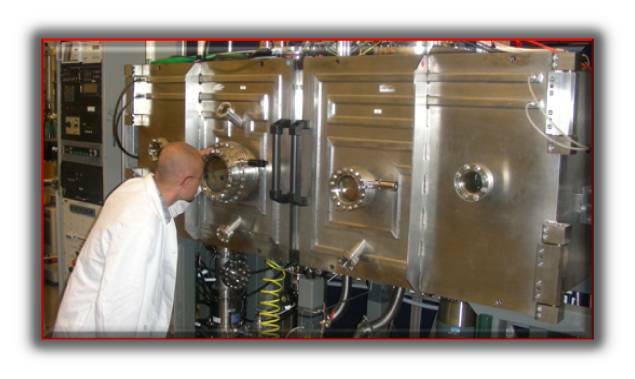 We are exploring epitaxial as well as non-epi growth of various materials systems by magnetron sputtering especially with practical substrates. Reel-to-reel magnetron sputtering is also being used to develop epitaxial buffer layer films on IBAD MgO templates on metal substrates for photovoltaics applications. 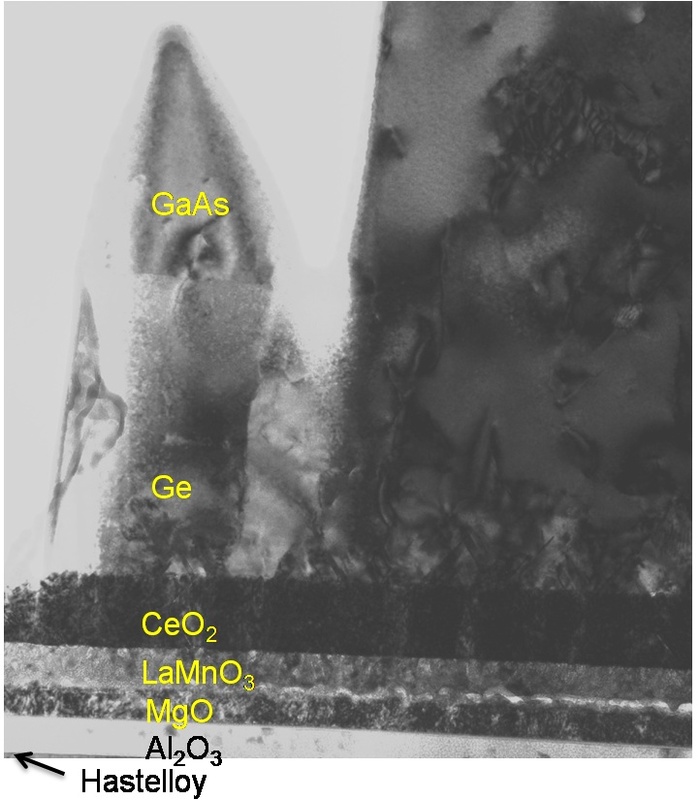 Single crystalline-like Ge films with in-plane texture less than 1� full-width-at-half-maximum (FWHM) have been successfully demonstrated using intermediate buffer layers containing CeO2 on flexible metal substrate.